Win a $50 Gift Certificate to Mastro’s Restaurant! Congratulations to Christine Oliver on winning our tenth High Five Giveaway and thank you to all who entered. 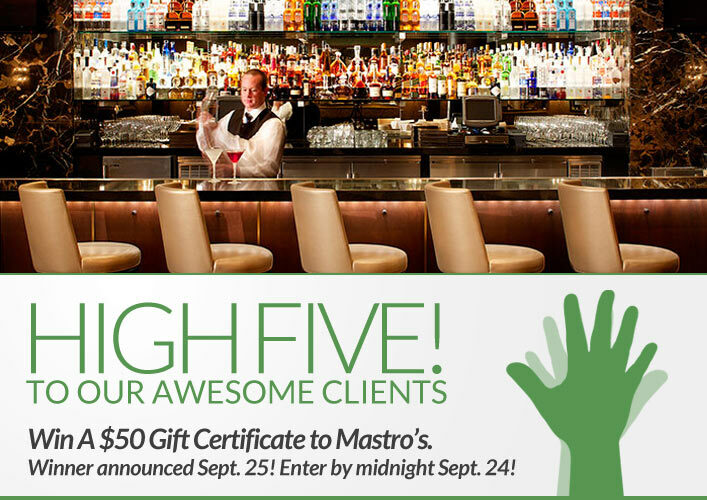 Our next High Five Giveaway is for a $50 gift certificate to Mastro’s Restaurant! We are starting to put together another great holiday benefit party this year. What is the name of one of the businesses that donated to last year’s holiday benefit? Hint: Visit this page for a long list of donors! Now, just add a comment to this post with the right answer to be eligible to win! The winner will be announced on Tuesday, September 25. Entries must be received by midnight on Monday, September 24. Good luck! Would be a great B-day gift! Catch 35. TJ is my favorite stylist at XEX! Emily Gallagher – my fabulous dentist who I found through my fabulous XEX stylist David!